I love banana pudding! I know this is a “summer dessert”, but I recently got sick and when I’m sick, I crave pudding. 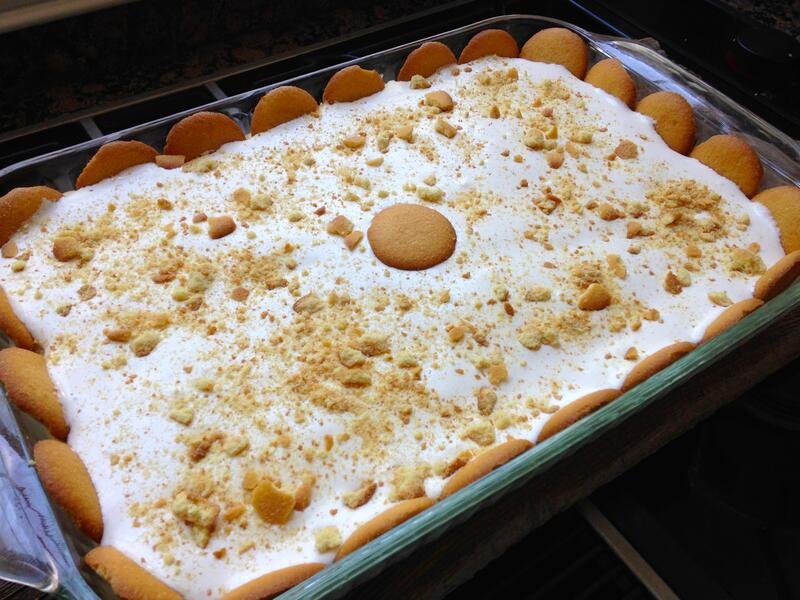 So… here is a recipe for my mother-in-law’s “Cold Banana Pudding”. It is different from traditional banana pudding because there are no eggs. The only ingredients you’ll need are instant pudding mix, skim milk, Eagle Brand milk, Cool Whip, bananas, and Nilla wafers! You don’t need a stove or an oven! My mother-in-law, Paula, is famous in our family for her Cold Banana Pudding. She makes it every time we go to the lake house… I’d say it has become a lake house tradition! I think in two days, our family cleaned this entire pan! 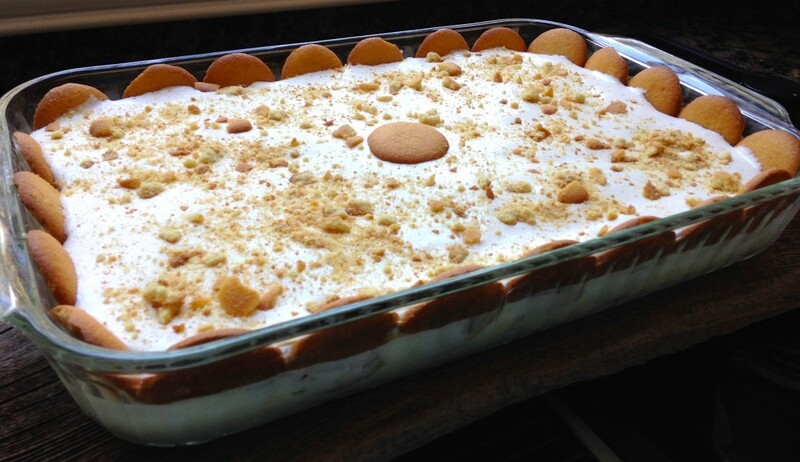 I love it cold…hence the name, “Cold” Banana Pudding. Try it today and see what you think! Paula and I use instant vanilla pudding, but you can use the instant banana flavored mix for that extra “banana” taste. Enjoy! Layer a 9 x 13 inch pan with Nilla wafers and sliced bananas. Combine pudding mix with 2 1/2 cup cold skim milk. Stir constantly for 2 minutes, or until pudding thickens. Pour in sweetened condensed milk, then fold in cool whip. Mix until smooth. Pour pudding mixture over wafers and bananas. Garnish sides and top of pan with extra wafers and banana slices. Sprinkle crushed wafers on top as well. Line the bottom of a 9 x 13 inch pan with Nilla wafers and sliced bananas. Mix together the instant pudding and milk. Add Eagle Brand milk. Fold in cool whip. Combine until smooth. Pour the mixture over the wafers and bananas. Garnish with crushed wafers. Chill until ready to serve. Store leftovers in refrigerator. 5 Responses to "Cold Banana Pudding"